I was visiting the Williams K. Sanders Library in Loudonville this summer to make frozen yogurt with the kids and Beth Bomba, who works at the library, brought in homemade marshmallow roasting sticks that she thought I might enjoy seeing & she was right, I LOVED IT! I’ve been waiting for the right day to share this fabulous idea that was passed on to her, on to me & now on to you & when visiting BlogHer12 I learned that today is National Make a S’More Day, so I thought it the perfect day for this share, because everyone needs homemade marshmallow roasting sticks to complete the s’more making process! How did I learn that today was National Make a S’more Day? By visiting the Hershey display at BlogHer12 where they set up an area for attendees to make S’mores at the conference each day. It was a hit with everyone! Step 1: Remove the medal part of the hanger. Step 2: Straighten the hanger hook at the top. Step 3: Use the wire clippers to remove the small bends in the wire that were inserted in the cardboard tube. Step 4: Insert the connected wire end into the cardboard tube portion of the hanger so that two prongs appear. Step 5: Cover the cardboard tube with electrical tape. Another Fun Trick: When you are all done roasting, remove the medal from the cardboard tube, squeeze the open prongs together and insert them into the tube for storage until you’re ready for a future roast. 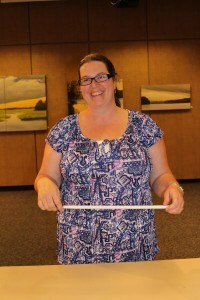 Thanks Beth for a FABULOUS share – we love our homemade marshmallow roasting sticks! And thank you Hershey for the GREAT S’mores at BlogHer12!